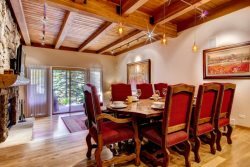 At Snowmass Village you have access to four major ski mountain areas from your vacation condo, and fantastic ski-in ski-out accommodations from The Ridge. Snowmass Mountain and the Aspen area average 300 inches of snow each year. Snowmass Mountain has over 3,000 acres of incredible ski terrain. New to Snowmass Mountain is an extended pipeline terrain park containing more intermediate jumps, a fun box and more. Of the Pipes and Parks, Snowmass boasts three big terrain parks, one super-pipe, and one rail yard. A new lift cuts down the ride time to only 8.5 minutes and there's also a new intermediate level terrain park on Velvet Falls. 6% easy, 50% intermediate, 12% difficult, 32% expert.